Okay, so my first day here, in the canteen, I was on chips. There was this girl. Student. Beautiful. Like a model, only with talking and thinking. She looked at you and you perved. Every time, automatic, like physics. Eye contact, perversion. So I gave her extra chips. Every time, extra chips. Like a reward for all the perversion. Every day, got myself on chips, rewarded her. Then finally, finally, she looked at me, like she'd noticed, actually noticed, all the extra chips. Do you know what I realised? She was fat. I'd fatted her. But that's life, innit? Beauty or chips. I like chips. So did she. So that's okay. 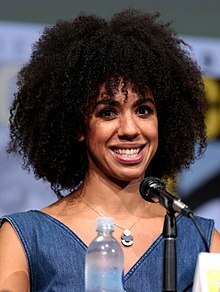 Bill Potts is a fictional character portrayed by Pearl Mackie in the long-running British science fiction television series Doctor Who. She becomes a companion of the twelfth incarnation of the alien time traveller known as the Doctor, portrayed by Peter Capaldi. Bill Potts: Why'd you run like that? Bill: Like a penguin with his arse on fire. The Doctor: Ergonomics. [points to his reflection in the puddle] That's my face, yeah? Bill: You seem a bit flexible on the subject. The Doctor: Oh, you have no idea. Bill: [about the TARDIS] Doctor, it's bigger on the inside than it is on the outside! Nardole: Hey hey, we got there! Bill: How is that possible? How'd he do that? Nardole: Well, first, you have to imagine a very big box fitting inside a very small box. Nardole: Then you have to make one. It's the second part people normally get stuck on. Bill: Is everything out here evil? The Doctor: Hardly anything is evil. But most things are hungry. Hunger looks very like evil from the wrong end of the cutlery. Or do you think that your bacon sandwich loves you back? Bill: What changed your mind? The Doctor: And relative dimension in space. [Opens the TARDIS door with a snap] It means… "What the hell." Bill: Why are you Scottish? The Doctor: I'm not Scottish, I'm just cross! The Doctor: What's the opposite of a massacre? The Doctor: In my experience, a lecture. The Doctor: I re-initialised the entire command structure, retaining all programmed abilities but deleting the supplementary preference architecture. Bill: He turned it off and on again. Bill: So how do we stay out of trouble? The Doctor: Well, I'm not the right person to ask. Bill: Traveling to the past, there's got to be rules. If I step on a butterfly, it could send ripples through time that mean I'm not even born yet in the first place, and I could just disappear. The Doctor: Definitely. I mean, that's what happened to Pete. The Doctor: Your friend, Pete. He was standing there a moment ago. He stepped on a butterfly. Now you don't even remember him. Bill: Shut up! I'm being serious. Bill: Regency England. Bit more black than they show in the movies. The Doctor: So was Jesus. History's a whitewash. Bill: OK, now's the time for the plan. The Doctor: That was it. No plan. Info-dump, then busk it. Nardole: Okay, Bill. Miss Potts. [removes his glasses, serious tone] I'm the only person you've ever met, or will ever meet, who is officially licensed to kick the Doctor's arse! I will happily do the same to you in the event that you do not align yourself with any instructions I have issued which I personally judged to be in the best interest of your safety and survival. [replaces his glasses, back to normal tone] Okay? Bill? Bill: Are you secretly a badass? Nardole: Nothin' secret about it, babydoll. Bill: It's an alien spaceship. The Doctor: There you go. Colonel Brabbit: But what's it doing? The Doctor: It could have chosen anywhere on this planet. It chose to sit on the strategic intersection of the three most powerful armies on Earth. So what it's doing, Colonel, is sending us a message. The Doctor: Human society is… stagnating. You've stopped moving forward. In fact, you're regressing. Bill: Well, this isn't exactly much better. Bill: Not so much for the people the Monks are killing. The Doctor: The Romans killed people and saved billions more from disease. War. Famine. And barbarism. Bill: No, wait. What about free will? You believe in free will. Your whole thing is -- You made me write a 3000-word essay on free will! The Doctor: Yes, well, you had free will, and look at what you did with it. Worse than that, you had history. History was saying to you, "Look, I've got some examples of fascism here for you to look at. No? Fundamentalism? No? Oh. Okay. You carry on." I had to stop you, or at least not stand in the way of someone else who wanted to. Because the guns were getting bigger, the stakes were getting higher, and any minute now, it's gonna be "Goodnight, Vienna". By the way, you never delivered that essay. Bill: Because the world was invaded by zombie monks! The Doctor: Humanity's doomed to never learn from its mistakes. Bill: Well, I guess that's part of our charm. The Doctor: No. It's really quite annoying. Bill: Why do you put up with us (humanity), then? The Doctor: In amongst seven billion, there's someone like you. That's why I put up with the rest of them. The Doctor: He's an Ice Warrior. Bill: And they're the proper martians, right? They belong here? The Doctor: Yes, the indigenous species. An ancient reptilian race. They built themselves a sort of bio-mechanical armour for protection. The creature within is at one with it's carapace. The Ice Warriors. They could build a city under the sand yet drench the snows of Mars with innocent blood. They could slaughter whole civilisations, yet weep at the crushing of a flower. Bill: What, you can deal with big green Martians and, and, and rocket ships, but you can't deal with us being the police? Godsacre: No, no, no, no, no. It's just such a fanciful notion. A woman in the police force. Bill: There’s, um, something I should explain… This is probably just a really difficult idea. I don’t like men… that way. Bill: No. Not ever. Only women. Lucius: Oh. All right, yeah, I got it. You’re like Vitus, then. Lucius: He only likes men. Vitus: Some men. Better-looking men than you, Lucius. Lucius: I don’t think it’s narrow-minded. I think it’s fine. You know what you like. Bill: And you like… both? Lucius: I’m just ordinary. I like men and women. Bill: Well, isn’t this all very… modern. Lucius: Hey, not everybody has to be modern. I think it’s really sweet that you're so… restricted. Razor: Do you want the good tea or the bad tea? Razor: I call one good, one bad. Bill: Er, I'll take the good one. Razor: Excellent. Positive attitude. Will help with the horror to come. Razor: [Handing Bill a cup of tea] Drink it while it's very hot. The pain will disguise the taste. The Doctor: Bill? Bill, talk to me. What have they done to you? Nardole: Operation Exodus… whatever that is. Missy: [from behind them] Well, wrong name, for a start. Missy: [standing at one side of Bill] This is not an exodus, is it? More of a beginning, really, isn't it? The Master: I'd call it a genesis. Missy: You've met the ex. The Master: Specifically… the genesis of the Cybermen. Bill: I am not upset. The Master: Oh. Well doesn't that take all the fun out of cruelty? Bill: [Looking at her fallen Cyberman body] Am I dead? Heather: [kisses her] Does that feel dead to you? Heather: You're like me now. It's just a different kind of living. Bill: How did you find me? Heather: I left you my tears, remember?